These both come via my wife. We attended the Seattle Emerald City Comicon in 2007, the first comics convention for either of us. 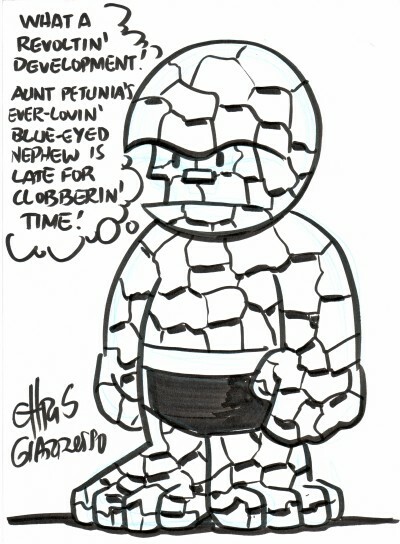 My wife was unnecessarily apologetic for influencing an artist's likely choice of subject of one of the two sketches I'd commissioned elsewhere, and the Ben Grimm commission here was her way of apologizing. 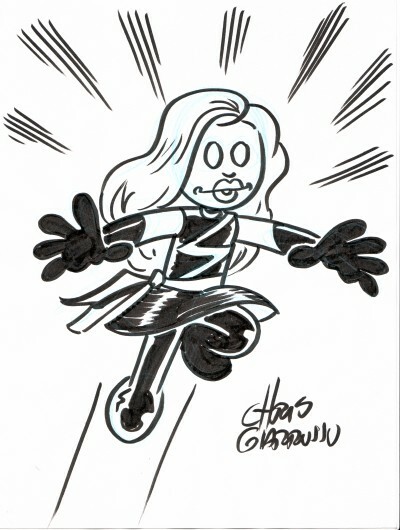 The Ms. Marvel she commissioned for herself, being a lifelong fan of that character. Chris Giarrusso is best known for Mini Marvels which appeared as Bullpen Bits in Marvel promotional and letters pages in the late 1990s and later blossomed into a couple of one shots of their own. My wife says that she and Chris hammered out the Thing's words together, and that and the Charlie Brown-like appearance of Ben really make the Thing picture incredibly cute. This is something which I never would have thought to buy on my own; I'm very glad my wife knew better!